More than 20,000 rice farmers in the Indonesia, the Philippines, Thailand and Vietnam benefitted from receiving direct support from BRIA project between 2014 and 2017. The recommended production practices raised the participating farmers’ incomes in the range of 10 to 25 per cent. The project has attempted to substantially contribute to food security in these major rice producing and consuming countries. BRIA is a public-private partnership project initiated by the German Federal Ministry for Economic Cooperation and Development (BMZ) to promote sustainable development of the regional rice sector and improve the livelihoods of smallholder farmers in Indonesia, Thailand, Vietnam and the Philippines. Its partners include such private companies as Bayer, BASF, Olam, Yara, DSM and national agencies like the Thai Rice Department under the Ministry of Agriculture and Cooperatives, the Philippine Department of Agriculture, the Indonesian Ministry of Agriculture and the Vietnamese Ministry of Agriculture and Rural Development. Impacts of and the contributions made by the project are given below. In Indonesia, 375 Sustainable Rice Production Centres (SRPC) were established in the two provinces of East Java and North Sumatra. A total of 125 field coordinators were trained, with each coordinator assuming responsibility for three centres. The coordinators set up the Farmer Field School to transfer proven rice farming technologies to lead farmers, who are in turn expected to pass on the knowledge to more farmers. The project also addressed the malnutrition problem in the country by introducing rice fortification with micronutrients. In the Philippines, BRIA has contributed to the country’s long-term goal of making rice production in the country responsive to food security and global competitiveness. The local government units (LGUs) and their respective extension service-delivery mechanism were strengthened by training agricultural extension workers (AEWs) and lead farmer technicians (LFT) in Iloilo, Southern Leyte and Aurora, who have an outreach of around 8,000 farmers. The BRIA training compendium containing 17 training modules including the final body of knowledge products, will be turned over to the Department of Agriculture. In Vietnam, the income situation of rice farmers has been improved by raising rice production in an ecologically sustainable manner and improving access to quality markets. In cooperation with the Institute of Policy and Strategy for Agriculture and Rural Development (IPSARD), the project worked with private sector actors to pilot public-private partnership (PPP) models for large-field rice cultivation in the three provinces of Dong Thap, Hau Giang and Kien Giang. The objectives are to improve the quality of rice, increase farmer income, optimise value chains and strengthen cooperatives. The stakeholders in the collaboration include farmer cooperatives, farmer groups, rice traders, rice millers and input suppliers. In Thailand, farmer training on Good Agricultural Practice (GAP) and the Sustainable Rice Platform (SRP) standard was conducted, covering 200 Community Rice Centres in Ubon Ratchathani, Surin, Sisaket and Roi-Et provinces. Trained farmers are encouraged to share acquired knowledge with their neighbours. Furthermore, television campaigns have also promoted safe pesticide application, soil management, quality seeds and sustainable rice production. Materials on post-harvest management were produced to help farmers minimise losses and improve quality. 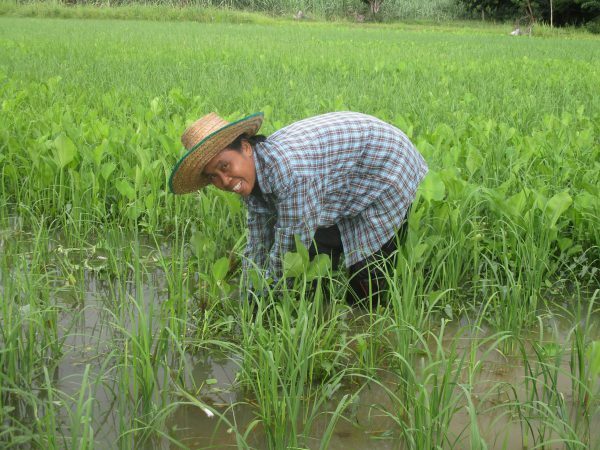 “After joining the SRP standard programme, I applied the knowledge received from BRIA and the Thai Rice Department experts to my rice field, and noticed the difference. Previously, I faced problems with productivity and disease outbreaks, and lacked knowledge about the proper use of fertilisers. Since attending the training, I am now able to apply fertilisers optimally, based on soil testing; productivity has improved significantly as a result. I could sell my rice to the miller at a higher price than other farmers. I can see the benefit of joining the SRP programme and am willing to invite other farmers to participate in the programme,” said Mrs. Lumpai Na-ngam, a member of Bua Ngam Community Rice Centre (CRC), in Det Udom district, Ubon Ratcha¬thani province, Thailand. “In 2016, Indonesia stopped importing rice from other countries. One of the driving factors is the BRIA programme, which aimed to improve the livelihoods of farmers. Agricultural technology promoted by BRIA can increase harvest by up to 40% and reduce production costs by 20%. Hopefully in 2017, we will be able to take on the role of rice exporter,” Mrs. Sri Kuntarsih, Director of Financing Facilities and Crop Insurance, Directorate General of Agricultural Infrastructure and Facilities, Indonesian Ministry of Agriculture, said.